In the third installment of "Diary of a Busy Teacher", Lisa describes her unexpected experiences during prep time. Despite never going as planned, Lisa shares why prep period is an essential part of every teacher's day. Hi there! 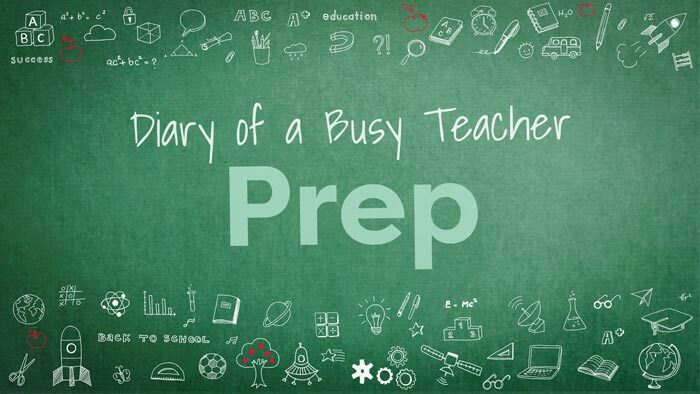 In this week’s installment of Diary of a Busy Teacher, we discuss the realities of prep time. “Prep time” are those 40 sacred minutes each day when teachers get to prepare for the next day. Prep time is not to be interrupted or misused, as it is the one time during the day where the kids are off at a specialist. Without needing to eat lunch or attend a meeting, prep time should be a constructive use of time for teachers. Sounds serene, right? Then how does it always end up being the shortest part of the entire day, every day? In this installment of Diary of a Busy Teacher, we consider the differences in what we expect to get done during our precious prep time versus what actually happens. The kids finish their snacks two minutes before the start of their specialist at 10:05. They quietly line up in the hallway and we silently make our way to art, or gym, or library, and make it there exactly on time. I'm somehow able to teleport back to my classroom and make full use of the forty minutes of prep time from 10:05 to 10:45. Once in the classroom, I carefully prepare math, reading, writing, social studies, interventions, and a read aloud for the following day. I pick up the kids right at 10:45 and we continue along with our day. Snack is ending. "TWO MINUTE WARNING! ", I yell, over the chaos of kids, exhausting all energy after sitting for an hour of math. Little Johnny just returned from the bathroom five minutes ago, the milk helpers forgot to get the milk, and there are crackers on the floor just waiting to be stepped on. Somehow that two minute warning turned into 10:04 AM, giving us exactly one minute to get to our specialist. I am able to drop the kids off to their specialist at 10:06, and turn to head back upstairs from the gym. I decide to pop into kindergarten briefly to see if we are still on for Book Buddies later that week, and end up talking with the teacher and the kids for four minutes. Time check: 10:10. I have 35 minutes left of my prep. I walk into my classroom and settle in at my desk, glancing at the clock, which now reads 10:12. Time to get started! Despite preparing for 45 minutes this morning, and in addition to staying after school yesterday, I still have two things to finish before I can begin to plan for tomorrow; printing out a reader's workshop lesson and finding a chart for social studies. Those seem simple enough, right? I open the reader’s workshop lesson and give it a once over to remind myself of exactly what needs to happen at 10:45 am when the kids return. I click print and head to the printer at the other end of the hall. On my way, I run into the speech and language pathologist who wants to talk briefly about an upcoming meeting she has with one of my students. We wrap up our discussion and I continue along my merry way to the printer. I decide to live a little and actually go to the bathroom—because when else am I supposed to go? Wow, I made it to the bathroom before 12:45 PM today! It’s the little things. Back in the classroom, I sit down in my swivel chair with a big sigh. Time check: 10:21. Not too bad. I still have about 20 minutes to prepare for tomorrow. Oh, wait, I have to find that chart for my social studies lesson after lunch today! It’s finally time to begin the planning for tomorrow! Time check: 10:43. Time to get the kids. 16 minutes for prep. Not too bad! Be honest with yourself and accept that prep time is just as much a time to prep as it is to recharge. If teachers didn’t get a break in the day, we wouldn't be nearly as good at our jobs. Take the time you need to make the current day run smoothly–you’ll always figure out tomorrow when it comes. Share your favorite morning routine tips with us on Instagram, Facebook, Twitter, Pinterest, and Google+.